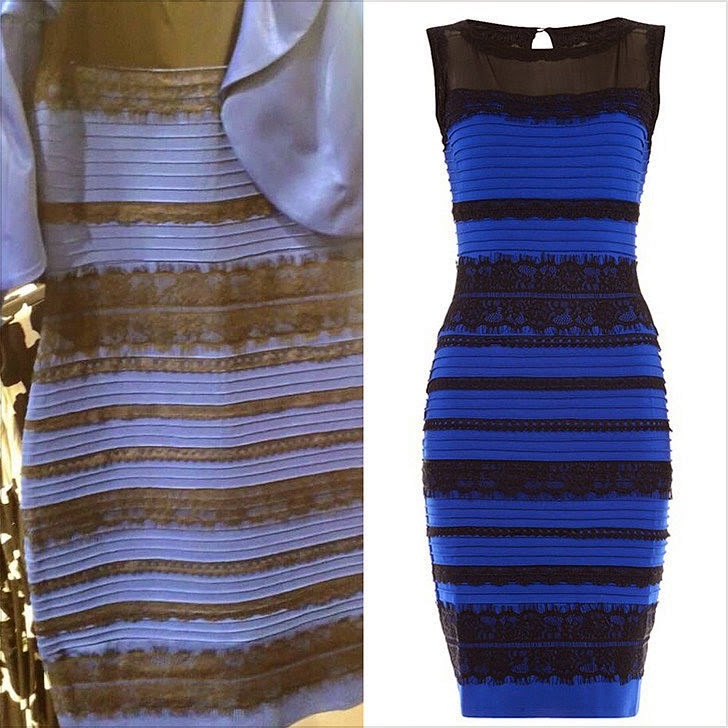 The Rabbi with a Blog (Rabbi Jason Miller): What Color IS That Dress? After last week's big debate over the color of a dress, a lot of my colleagues were trying to use the story of #TheDress in sermons. It wasn't so difficult this past Shabbat as many rabbis looked at Parshat Tetzaveh and the intricate details of the garb of the Kohen Gadol (High Priest), including the specific colors. Other rabbis opted to use the color debate of #TheDress to teach that we don't all see things the same way -- certainly a good lesson. I saw it as white and gold; not blue and black. However, after a couple glasses of wine the blue became visible to me. Interesting! The discussions at my family's Shabbat dinner on Friday evening included interpretations of how humans see color (my father-in-law's a retired ophthalmologist) and the metaphysical questions of what color an object actually is if humans see it differently. These arguments, er, I mean discussions, continued at Sunday brunch. I don't remember the last time I found myself talking about rods, cones, neural connections to the visual cortex, and the philosophy of color perception with my cousins. Dare I say, that was both the first time and likely the last. Purim is our festival of contradictions and hidden meanings. This year I suddenly noticed one detail that has been hiding in plain sight—the color of Esther’s royal dress? Was it blue, or gold? The Megillah itself is maddeningly ambiguous. We read in Chapter 5, “On the third day, Esther was garbed in royalty.” The ancient rabbis noticed something strange about the verse. It should have said that she was dressed in “royal garments” (בגדי מלכות מיבעי ליה), but instead says that she wore “royalty” (וַתִּלְבַּשׁ אֶסְתֵּר מַלְכוּת). What does that mean? What does that look like? In Esther Rabba 9:1 we are told that she was accompanied by two maidens, resting her arm on one of them, while the other walked behind and held up her golden train. This would imply that her dress was gold. But read ahead in the Megillah to chapter 8, verse 15. There we are told that Mordecai wore “royal garments of blue” (בִּלְבוּשׁ מַלְכוּת תְּכֵלֶת), with white trim and a great golden crown. This implies that to wear royal garments in the Megillah is to wear blue. So what color was Esther’s dress—blue, or gold? There is something strange going on here, something hard to pin down. In fact, the Talmud acknowledges this at B. Megillah 15a, where Rabbi Elazar, citing Rabbi Hanina, concludes that Esther “wore,” not a simple garment, but the holy spirit. Later midrash adds that King Ahaseurus couldn’t figure out what he was looking at—he tried to look away, but angels compelled him to look at Esther, and seeing her cloaked in the holy spirit itself, he could not resist her plea. Who has ever seen a garment like that? Only this week a clue to the mystery emerged at a wedding on the Scottish island of Colonsay, where the mother of the bride wore a dress that has confounded millions. Some see it as gold and white, others as blue and black, and some, like me, have seen it both ways. Has this dress replicated the mystery of Esther’s royal garment? It was blue, it was gold, and ultimately, it transcended normal senses. Nonsense? Or, the holy spirit?